1984 was the year that the Raymond Carver Award was established in Vol. 30 with a sponsorship by HSU’s Department of English. It was an annual short story contest with a $500 cash prize which reeled in hundreds of submissions to Toyon from around the world each year, and was active until 2005. The short story “Lola” by Laura Camozzi was selected as the inaugural award winner which followed the unnamed cousin of Lola through her loss of innocence, and references the 1960s Berkeley protest for the Anti-War movement. ​Also in Vol. 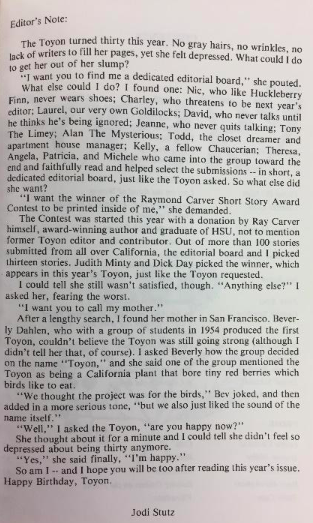 30, Jodi Stutz wrote an editor’s note that includes comments from one of the founders of Toyon, Beverly Dahlen, about choosing the name of this publication to which she jokingly said, “We thought the project was for the birds.” Subsequently, in 1987, following her tragic death, the poetry award was named after Jodi Stutz. The award has been funded by Dean Cyril Oberlander and the University Library in recent years. Jodi Stutz. Editor’s Note. Toyon, 1984, Humboldt State University Library, Arcata, California. 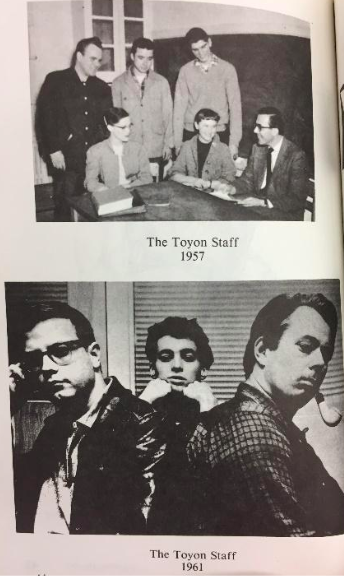 The Toyon Staff 1957 and 1961. Toyon, 1984, Humboldt State University Library, Arcata, California. 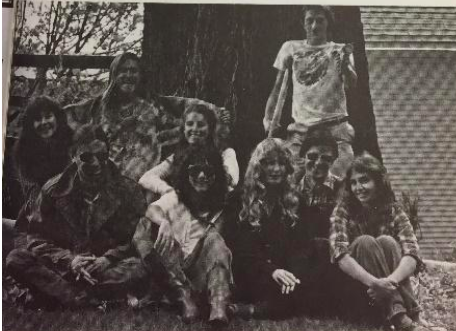 The Toyon Staff 1984. Toyon, 1984, Humboldt State University Library, Arcata, California.